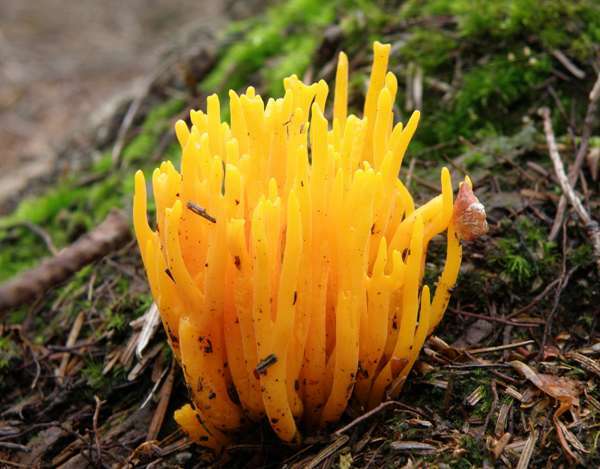 Calocera viscosa is greasy and therefore, in texture, unlike the true coral fungi. It is commonly known as Yellow Stagshorn, although the colour is more often pale orange. A white form also exists, but it is not a common find. 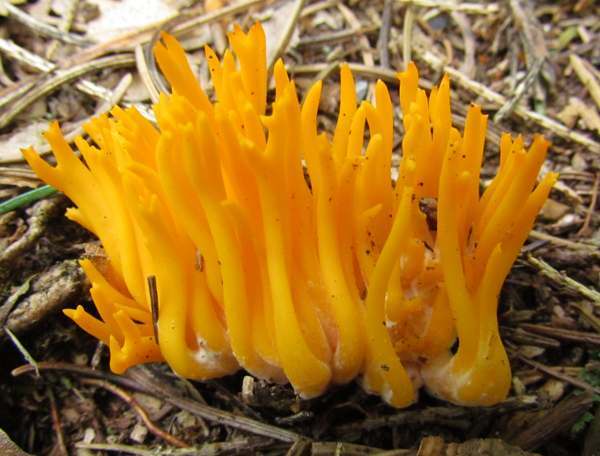 Confusion with yellow-orange species in the family Clavariaceae is avoided by checking the growing substrate: Calocera viscosa always grows on wood, although sometimes the substrate is not immediately evident if it has become buried beneath leaf litter or moss on the forest floor. Common and widespread throughout Britain and Ireland, this wood-rotting fungus is found in most parts of mainland Europe as well as in many other regions of the world including North America. Yellow Stagshorn was described in 1794 by Christiaan Hendrik Persoon, who gave it the binomial scientific name Clavaria viscosa. 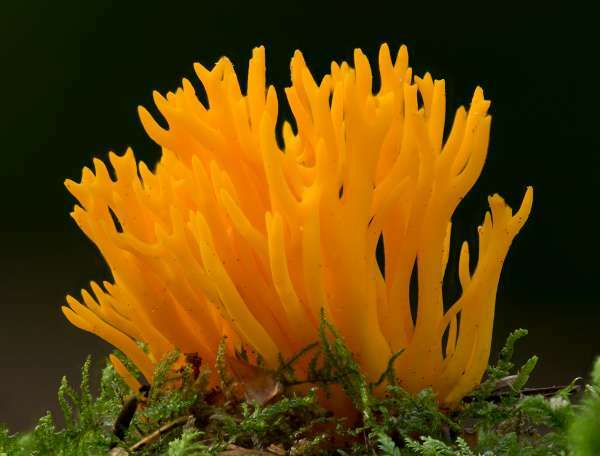 In 1827 the great Swedish mycologist Elias Magnus Fries, who had established the genus Calocera in 1821, renamed this species as Calocera viscosa, which has remained its accepted scientific name up to the present time. 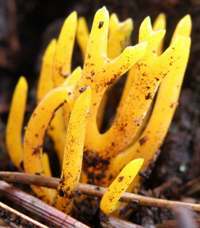 Synonyms of Calocera viscosa include Clavaria viscosa Pers., Calocera flammea Fr., Calocera cavarae Bres., and Calocera viscosa var. cavarae (Bres.) McNabb. Calo- as a prefix means beautiful, while the extension -cera comes from ancient Greek and means 'like wax', so that the genus name Calocera translates to 'beautiful and waxy' - and surely Calocera viscosa, which is the type species of its genus, deserves such an accolade. Just as it sounds, the specific epithet viscosa simply means viscous, sticky or greasy, and when it is wet the Yellow Stagshorn does indeed have a sticky surface. Bright orange or orange-yellow, up to 10cm tall, greasy and viscid, with antler-like branches often forked near the tips - hence the common name Jelly Antler Fungus is sometimes given to this species. In dry weather, the colour can become orange-red. 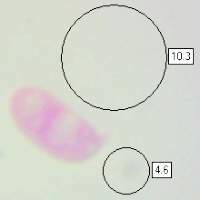 Ellipsoidal to sausage-shaped, 8-12 x 3.5-5µm; hyaline; inamyloid; sometimes becoming septate when fully mature (developing a single dividing wall); each spore containing two oil droplets. On roots and stumps of conifers. Fruiting through most of the year, but particularly prevalent in autumn. 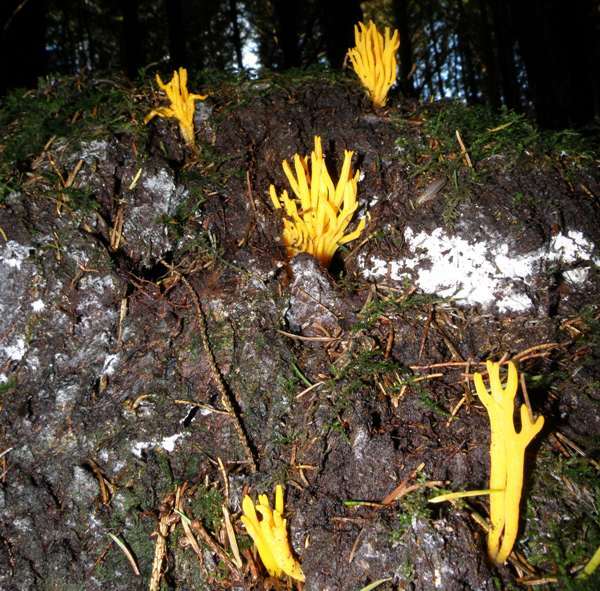 Yellow Stagshorn fungus could be confused with some of the Ramaria species of coral fungi, but the greasy, viscid surface of Calocera viscosa is an immediately obvious distinguishing feature. 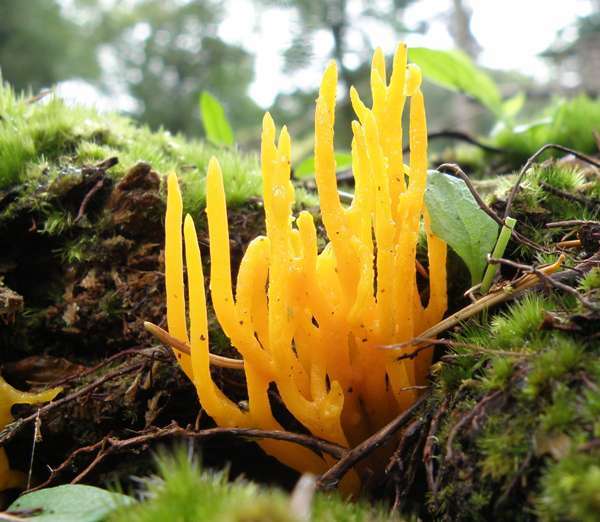 Although not known to cause poisoning, the Yellow Stagshorn fungus is generally regarded as inedible because of its gelatinous texture, lack of flavour and insubstantial proportions - although some sources do list it as edible but of very little culinary value except to add colour to other mushroom dishes. McNabb R.F.R. 1965a. Taxonomic studies in the Dacrymycetaceae II. Calocera (Fries) Fries. New Zealand J. Bot. 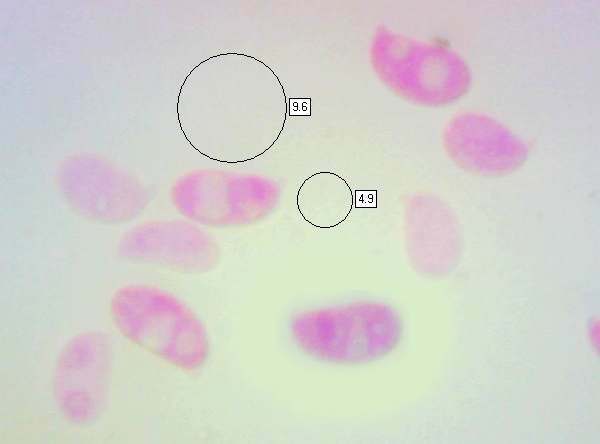 3: 31–58.